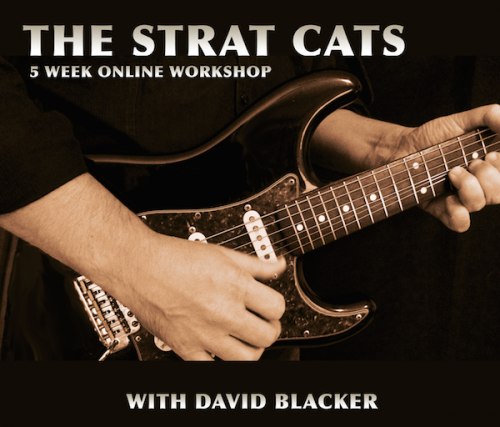 5 week online micro-workshop covering the “Strat Cat” sound. The “strat sound” is an essential blues texture, and even more so when it comes to Jump and West Coast Blues styles. Players like Duke Robillard, Ronnie Earl, Anson Funderburgh, Jimmie Vaughn and Little Charlie Baty play lines that accentuate the Strat's unique tonal characteristics. This package includes 6 lesson segments, each containing 1 twelve bar solo featuring key strat cat licks and phrases. Each of the 6 individual segments contain a performance video, an explanatory video (breaking down the performance), tablature and a jam track. The Workshop is in video exchange format, which means each week you can submit a video performance and I will provide video custom feedback on that lesson segment. The course is notated using "Soundslice" which provides mobile ready tab, with playback speed controls and synched to the actual video content.